DIY Bar is a gathering place in Portland, Oregon to get your craft on. On their website they say, "we're bringing people together to work on individual projects from our craft menu. Think of it as a Pinterest workshop where you get to sip on your favorite wine, beer, or cider. We've done the work for you to find the projects, gather the tools, and the materials needed to make beautiful and functional crafts." 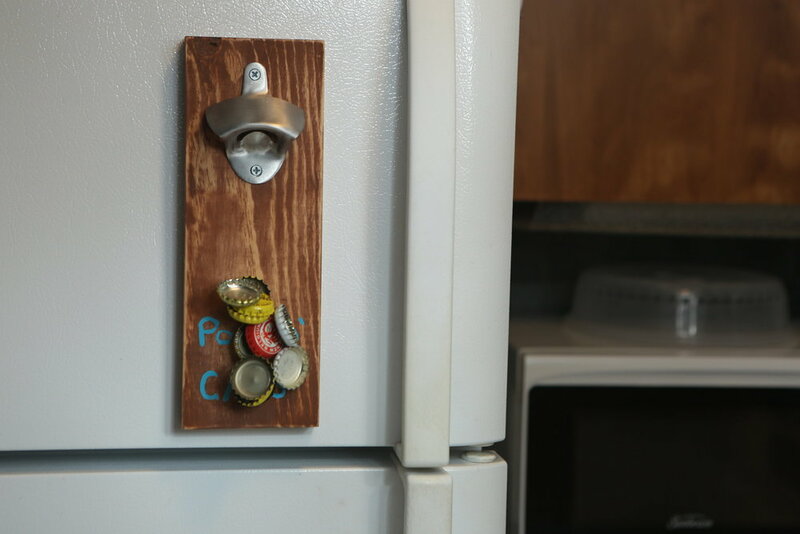 DIY Bar is a place for crafty and not so crafty people. It's part crafting studio, part bar. We supply the tools, materials, and tutorials for folks to sit down and complete a project from our project menu. It's similar to a paint and sip place, but we offer any of our projects at all times. The projects are self-guided with tutorials, and our craft-tenders are around if anyone needs assistance. We welcome everyone, but we're geared towards adults. As adults, it's easy for us to lose track of our creative and playful sides. We want to bring that back in those who have lost it, and continue to fuel it for those who still have it. Why did you choose the ReBuilding Center for materials? We share similar values as RBC. We grew up in the waste industry and worked in it before starting DIY Bar. We are familiar with how much waste is generated and the importance of using reclaimed materials. RBC is our go-to for reclaimed building materials. We're happy to say the heart of our bar (the bar) is made with materials from RBC. How did RBC and DIY Bar get connected? We familiarized ourselves with RBC by being involved with the waste industry. And now that we're neighbors it's even better (and dangerous because there's so many good things in there). What is it about DIY culture that interests you? We want to share the experience and feeling you get after completing a project. For us it's a feeling of satisfaction and accomplishment. You can look back at your project and know you made or built it with your hands. You've put your own creative twist on it. You made that thing! What are some of the projects you're most excited to lead? As mentioned above, we'll have craft-tenders to help support folks with their projects, instead of leading individual projects at a time. What types of projects will you be hosting? We have about 20 different projects on our craft menu. They range from leather projects (clutch purse, wallet, passport holder), to light wood working (6-pack carrier, drop catch bottle opener) to home goods (magnetic shelf, cat scratcher) to jewelry (hex nut bracelet, beaded wrap bracelet, tree of life necklace) to a variety of other projects (nail and string art). They're projects with a purpose! What kinds of materials will be used? We have a lot of different types of materials! We'll be using wood, string, nails, paint, magnets, leather, feathers, beads, chains, etc.